Recordings | McGinty Music, LLC. Tuba — a remarkably expressive instrument, especially when played by Doug Tornquist! This album features music for tuba with unique combinations of instruments, giving everyone the opportunity to hear Doug’s beautiful tone quality, brilliant technique and musical style. This recording includes the premiere recording of Bruce Broughton’s Bipartition for tuba and cello and Morton Gould’s Suite for Tuba and 3 French Horns. Three compositions are available at McGintyMusic.com: Feels Like Far (flute, clarinet, trumpet, horn & tuba), On The Out-Side (clarinet, horn & tuba), both commissioned by Dr. Tornquist and Equinox (cornet, 3 horns, tuba, 2 trumpets, 2 trombones & bass trombone). Please note: Only the compositions published by McGintyMusic.com are available for individual download. The complete CD has these three pieces as well as the Gould and Broughton. Christmas! That wonderful time of year when you can hear brass players heralding this season of expectation, wonder and awe. With colorful lights and festive carols, we all come together and join in song. Every carol was arranged specifically for this album, each combining the musical expertise of the performers with the craft and individual styles of the arrangers. 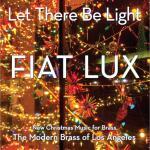 More Carols From The Bells, Volume 1 and Volume 2 – Trombones-L.A. This double CD has forty Christmas favorites – a joyous way to celebrate the holiday! The arrangements are incredibly fresh and creative. The magnificent sounds from the bells of the best professional trombone players in Los Angeles will both surprise and delight you for years to come. Thirty of these pieces are available as individual mp3 downloads and the quartets are available for flute, clarinet, bassoon, saxophone, brass and, of course, trombone. The more players the merrier! Proceeds from the sale of this CD benefit The Hearts of Music Fund, a non-profit fund established to assist musicians with emergency medical needs. Hopefully this CD, in addition to developing a wider audience for this music, will also find a broader base of support and awareness of The Hearts of Music Fund. Out of Bounds features the bass trombone as soloist with various chamber ensembles. English bass trombonist Michael Eversden performs with brass quartet, wind quintet and string quartet and duets with percussion, violin and flute. The instrument is rarely heard as a soloist and most of the pieces on this disc are rarely performed or have not previously been recorded. Includes Nelson Riddle: Five Pieces for bass trombone, Patrick McCarty: Sonata and Frigyes Hidas: 1+5, together with Anne McGinty’s ‘Soundscapes’, for bass trombone and violin. For thirty five years the Tower Brass Quintet has creatively and progressively shaped their reputation as a premier chamber music ensemble, delighting a broad spectrum of audiences with their unique style of programming and performance. “Road Trip” is their tenth CD. The Tower Brass Quintet has performed throughout the country and abroad for audiences in communities that take an active interest in the arts. They have released nine CDs, with Ryan Nowlin’s A Christmas Fanfare being the leadoff piece on this, their Christmas album, with 18 more joyous pieces for your holiday pleasure. Bill Reichenbach. Bill Reichenbach’ arrangement of Angels We Have Heard On High is included, along with 20 more great charts.